The capital campaign industry has been operating more or less the same way for nearly a Century. But now, fueled by the internet, the traditional models are being replaced by new, more efficient systems and practices. For as long as we can determine, whenever an organization considered a capital campaign, the first step has always been to reach out to consultants for help. That’s because most organizations only embark on capital campaigns once every ten or twenty years, so nonprofit staff and volunteers have little or no experience leading capital campaigns from start to finish. You may have been at an organization during a capital campaign, but chances are good that you haven’t guided a campaign from A to Z. As a result, you may not feel confident in your ability to lead a big capital campaign. So what do you do? You call a capital campaign consultant who holds that specialized knowledge about how to run a campaign, of course! But that’s not the only way to approach your capital campaign. Now there is another path you can take. Thanks to technology, easier access to resources, and new methods of communication, you’ve got other options. By creating the Capital Campaign Toolkit, we’re reinventing the way nonprofits approach capital campaigns. We’re putting YOU in the driver’s seat with the information and material you need to guide your campaign to success! In the past, consultants held all knowledge, materials, resources, and tools with which to conduct a successful capital campaign. But now, YOU will be able to make the choices that are best for your organization and only engage consultants when their outside expertise will matter the most. You are still likely to use consultants to train your board, coach your campaign leadership, conduct an external feasibility study, and serve as an outside expert advisor for you, to make sure you’re on track. But no longer will you need consultants to lead the way and impose their standard models on your campaign. 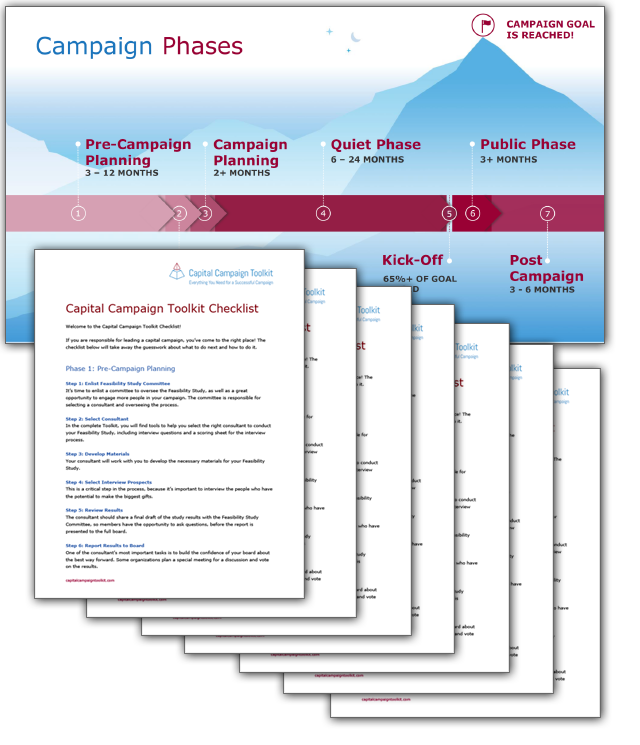 Because with the Capital Campaign Toolkit, you have a clear roadmap and material you can use for your campaign. The ways campaign consultants are doing business is changing, too. 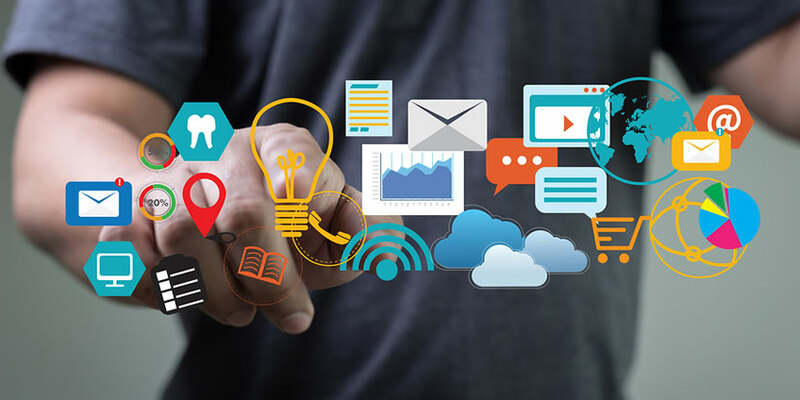 Thanks to the internet and new communications technology, consultants can support their clients more efficiently and effectively. Gone are the days where they need to hop on a plane and spend a full day with you every month. Thanks to video chat, you can have face-to-face meetings with your consultant, without paying for travel expenses and without the consultant leaving the comfort of their home office. And you can easily share documents and work collaboratively using Google Docs, Dropbox and other systems. Not only that, when both you and your consultants use the Capital Campaign Toolkit to guide your campaign process, you’ll be real partners in your work, operating from the same playbook. In other words, you won’t need consultants to dole out expert information. Instead, they’ll work with you to adjust and adapt best practices to fit your specific situation. Find out more about the new approach to capital campaign fundraising by signing up here. 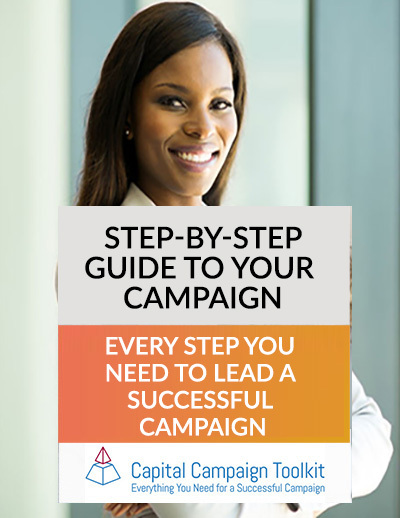 When you sign up, you’ll get an excellent FREE Step-by-Step Guide and Campaign Timeline. In addition to the free step-by-step guide, you’ll also get access to a webinar that will give you loads more useful information. Sign up now!